discounts, coolest promotions and hottest products! Drive, Mall of Asia Complex, Pasay City. Trade Visitors and Professionals only. Come to the country's biggest and most exciting I.T show! Every year, the Computer Manufacturers, Distributors and Dealers Association of the Philippines [COMDDAP] brings together distributors and resellers in one big event to celebrate the progress of the country's information technology industry. Find the world's leading makers of I.T products, solutions and peripherals under one roof, with their best and latest products on sale at great discounts and promotions. Even if it is the best procurement platform in the Philippines, COMDDAP EXPO 2007 is not just for techies, purchasing managers or I.T. professionals. This celebration is for anyone and everyone, because whatever we do, I.T is in our lives. I forgot to make a blog post about my lecture and now that I have more time to blog and for today is my rest day in events and other stuff. I also uploaded a recorded version of my lecture about blogging your business to success and also an introduction to blogging. I used a Creative Zeon 2 mp3 player with recorder in documenting my lecture so that I can share it to all. Im not a professional in blogging and I know Im not the right guy for giving lectures, but the people around me chose me to share my experience and knowledge about web blogging. Im so scared in talking in this big event and If there are any bloggers who are offended or do not acccept what I said in this lecture, it will be better to note me privately and correct me if theres something wrong in my lecture, so that I can notice my mistakes and improve it more. I arrived at around 2:30pm and almost got a trouble in arriving in the venue, got so tired in organizing my own event at the comic seminar and I created my slides and web page screen caps that morning, in other words,, cramming hahaha, It was like back in college, preparing a big presentation for my thesis. Been blogging snce 2003 and using the internet in my business since 1997, so you can see a big structure on how and when did I started in this internet thing and making it as a career today. I went to check the event on its first day of opening and see who will be my attendees and I just observed that most of them are students and business people. I tried making a funny and entertaining slide, like putting cartoon characters and other images that seems to be more funny. like teddy bears, animals and celebrities. I did that just to make the audience focus on the slide and later on listen to my lecture and do some amusing stunts, making the atmosphere lively. Students are aware already on the blogging world and most of them are into Friendster and Multiply, thus they arent aware about the livejournal, blogger, wordpress and etc. Making an introduction about blogging raise more curiosity in my audience of business people. One of them asked a question on how will they use blogging as a tool for their businesses and some of them asked me if it is easy to use and is it cheap. I answered them that they can use it for business and for the web blog example I used in my slide and seems that they are convinced that they can use it as online shop, product catalog, and it is easy to use and cheap, less cost expensive in that way. Some student asked me questions about how can they use it for their business. I was surprised that these Rizal Technology University are into business and they shared to me that they have products for sale and like to learn more on blogging, but when i found out that he has a multiply account, I told him that he can use the blogging engine of multiply and photos album to upload his product and turn it into a virtual catalog. there was a coaching and mentorship program after the lecture, the students took photos of me with them and they will use it for their school study and also use it to show it to their professors. A salon businessman approached me and asked the same question too about how can they use blogging in their business. I just told them that they can have a blog with no cost and it can serve it as their official website, I just told them that you just need a regular writer to put blog post about your services, products and also put tips on about getting a great hairdo or make up. A community service officer from Candelaria, Quezon approached and told me that their org has a blog but he doesnt have the time to update it, I just told him that even that you spend more time in surfing social networking sites, you can use blog in reporting your activites and also promoting your community events and annoucements. just try to do a story from it and that will serve as your content for your blog. pretty fun on that day, met a lot of person and It was a great experience in sharing what I know about blogging. I even got a talk with the president of Argon Lasers light, he just shared to me this program about the discipline in getting and earning money out from nothing. which gives me interest in how can they raised a P800 from talking and not having any expense at all. hmmm I might try it soon and blog it about here. and hope we can have more talks and lectures about blogging. Download and listen to my blogging lecture. 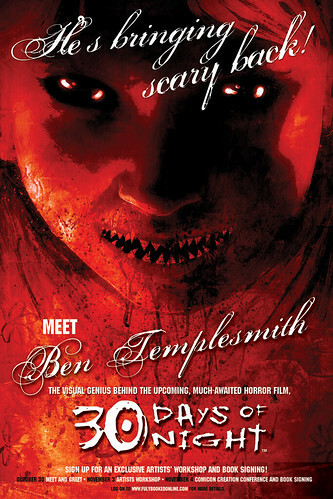 Comic artist of 30 days of night - > Ben Templesmith in Manila today! just to remind everyone that the comic signing and first appearance of Ben Templesmith in Manila will be today in Fullybooked, Bonifacio High Street. So grab your comics or buy one at Fullybooked and meet Ben Templesmith in person. This is a great Halloween comic event in Manila. The scary moment in comics is here hahhahaha. the up-coming, much-awaited horror film, "30 Days of Night." Sign up for the exclusive artists' workshops and talks! see you all later !!!!!!!! !